Are you shopping for HanStone Quartz countertops in the MD, DC, or Virginia area? HanStone countertops combine practicality with luxurious beauty and are great for homeowners seeking a high-end countertop for a kitchen renovation. HanStone Quartz can even be used for backsplashes and table top areas to create a modern look that seamlessly ties all aspects of the kitchen together. Keep reading to learn more about HanStone Quartz countertop qualities, and the benefits of installing these countertops in your home. HanStone countertops are not only a stunning addition to your home, they are extremely durable due to being comprised of mostly natural quartz, one of earth’s hardest surfaces. The natural strength of HanStone Quartz countertops makes it easy to preserve color, shine, and shape with little maintenance. Homeowners do not have to worry about everyday kitchen activities scratching or staining HanStone Quartz surfaces. As long as messes are cleaned in a timely manner and cutting directly on the surface is avoided, HanStone countertops will maintain their beautiful shine for years. At Express Countertops we know selecting a countertop surface for your home is a big decision that requires coordinating the color scheme and style of your countertops with the rest of your home. That’s why we offer 60 HanStone Quartz colors for you to choose from. HanStone Quartz by Hanwha Surfaces does not sell to the public, but Express Countertops is a proud dealer that offers all of the colors seen on the website. In addition to offering a wide selection of colors, Express Countertops allows you to customize the size, shape, backsplash, and overhang of your countertops when you order. Since we fabricate everything in house we can tailor your order specifically to your specifications. HanStone countertops are a popular choice among customers, but Tranquility Quartz (pictured on the right) is a favorite due to its pure white color and durability. You won’t be able to find a natural marble quartz countertop with this kind of durability from any other brand. Since Hanstone Quartz is made to be a luxury product, customers are naturally drawn to the sleek white color of Tranquility Quartz for the smooth and elegant look it provides. We recommend pairing this color with darker cabinetry to make the dark veining in the stone pop. 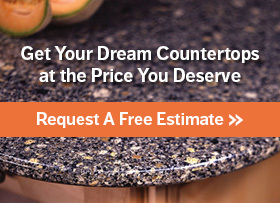 Ready to install HanStone countertops in your home? We make getting a quote quick and easy, simply upload a photo and we will get back to you with a price – no in-person meeting necessary! Or if you would like to get more information about the other brands we carry give us a call at 410-712-0601.